paidhal nenjE – Oh childish mind! uNarndhu pAr – try to know. Further more, he (maNavALa mAmunigaL) is divining about the greatness of this AzhvAr and also his prabandham due to there being no equal for them, starting with ‘uNdO thiruppallANdukku’. For this prabandham which is focused only on doing mangaLASasanam, is there an equal in other dhivya prabandhams that are focused on experiencing emperumAn and be immersed in that? – is how the difference of this prabandham (thiruppallANdu) is compared to these other prabandhams. uNdO periyAzhvArkku oppu oruvar – Can he (periyAzhvAr) who sustains himself by doing mangaLASAsanam to emperumAn’s beauty etc., be equaled by other AzhvArs who are (only) immersed in such beauty, etc., of emperumAn? ‘chinthai kalangith thirumAl enRu azhaippan [thiruvAimozhi 9.8.10]” ((Thinking whether I would be able to reach and live with you) with my worried mind I would call your divine name out (thirumAl)), and “chakkaraththu aNNalE enRu thAzhndha(u) kaNNeer thathumba [thiruvAimozhi 4.7.10]” (Saying that you mesmerized me by showing your disc and conch, would drop tears due to not getting your experience now), etc., where they get immersed in every which way they related to emperumAn) – so he (nammAzhvAr (of thiruvAimozhi)) cannot equal this periyAzhvAr isn’t it? This is applicable for other AzhvArs as well. 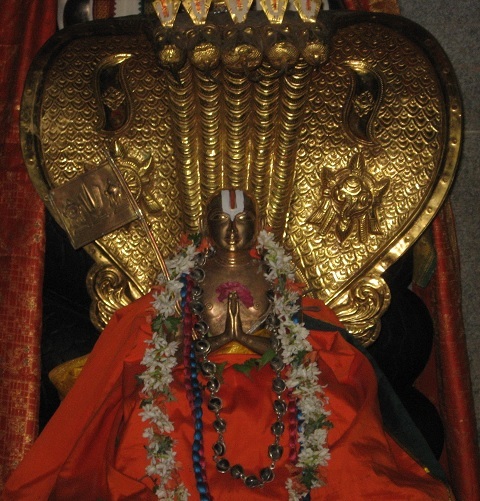 thaN thamizh nUl seydhu aruLum AzhvArgaL thammil uNdO periyAzhvArkku oppu oruvar – The other AzhvArs through the grace of sarvEsvaran had divined their prabandhams in sweet thamizh, can they equal periyAzhvAr who by nature cannot sustain himself without doing mangaLASAsanam to emperuman? avar sei kalaiyil thiruppallANdukkum oppadhu Or kalai thAn uNdO – As they wished by His grace their sustenance and growth (of experience with emperumAn), can they equal periyAzhvAr who wishes well for the growth of emperumAn? kalai -> dhrAvida prabandhams; their prabandhams are in thamizh that talk about brahmam. paidhal nenjE nee uNarndhu pAr – (Oh the childish mind you try to know whether those are equal to this prabandham) – Get out of your dumbness and using your true nature of having wisdom analyze the difference in greatness of this. Since in the aspect of getting‘ ‘mayarvaRa mathinalam’ [thiruvAimozhi 1.1.1] (unblemished knowledge) and divining dhivya prabandhams based on that is same among all of the AzhvArs, Oh the ignorant mind which thinks that due to this the other AzhvArs and prabandhams are equal to periyAzhvAr and his prabandham! At least now, since you have the ability to understand the huge difference between these, think properly and analyze it. Then only you can understand their huge difference. This entry was posted in Other, upadhESa raththina mAlai and tagged 74, annan, azhvars, erumbi, erumbiappa, kovil, mamunigal, manavala, mudhalazhvars, pallAndu, pasurams, periyAzhvAr, rathina, rathinamalai, raththina, raththinamalai, thirupallandu, thiruppallandu, upadesa, upadhesa on December 22, 2015 by raghuram.